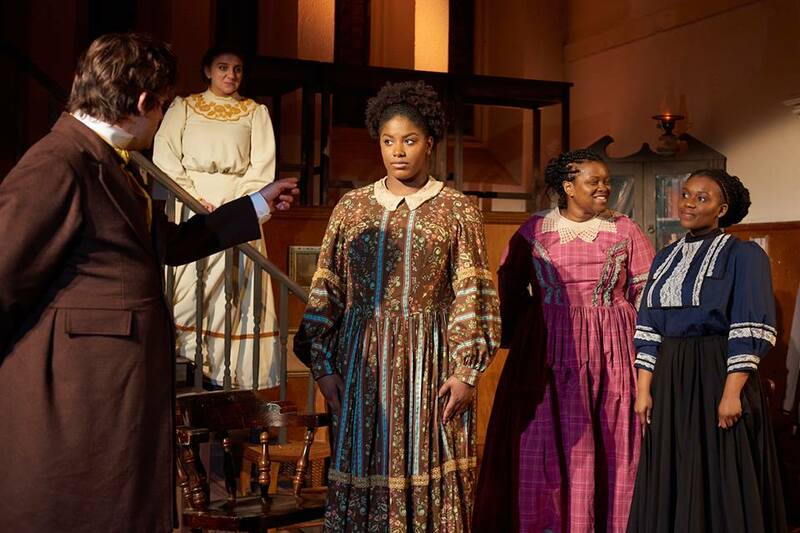 (Jamaica Plain, MA) OTP’s An Education in Prudence sold out its run. If you missed the readings, the workshops, or the performances, then the joke’s on you. Do yourself a favor and donate to OTP so they can create more important works. Prudence deserves, at the very least, a performance in Canterbury, CT. They’ll need our help to get there. In 1833, Prudence Crandall opened a school for Black girls in Canterbury, CT. It closed in 1834 when an angry mob of vintage tiki nazis destroyed the school. The white folk felt threatened by Black independence. Their double standard was appalling: ending slavery = “good.” Treating Black people like equal citizens = bad. An Education in Prudence shows us how Crandall (Caitlin Gjerdrum) came to open the school. We’re shown the journey of the girls (Christa Brown, Shana Jackson, Tenneh Sillah) willing to risk their lives to attend. Both are presented via a family’s visit to the Prudence Crandall Museum. It’s an interconnection of complicated stories but it translates to the stage quite well. OTP needs to take its brilliant cast and go on a New England school/museum tour. Canterbury, CT needs to bankroll all of it. It’s the least it can do. Barring that, the script and current cast need grant funds to produce it for regular performance at the Prudence Crandall Museum and other P. Cran institutions. It’s perfect for educational theatre purposes. Elementary kids could learn a lo from its messages. With the NEA at risk, young theatre enthusiasts/actors need to see theatre activism at work. Their parents need to demand that their politicians continue NEA funding. We must stop telling Black stories through white bravery. (White history loves a white savior.) While it is important to recognize Crandall’s contributions, it was the lives of the rebel girls on the line. They are the reason Canterbury threw an murderously epic tanti, and yet we know so little about them. History has all but erased the names of Crandall’s students. It is refreshing that Lanfer gives us the stories of Sarah Harris, Julia Williams, and Eliza Hammond but inclusion is not enough. After all, it’s called the Prudence Crandall Museum and not the Sarah Harris Museum. P.S. Unitarians were as racist as the rest of us. 1967 was an embarrassing year for the UUA. This entry was posted in Drama and tagged 2018, An Education in Prudence, Beth Miller, Canterbury, CT, Eliza Hammond, February, Jamaica Plain, Julia Williams, Open Theatre Project, Pascale Florestal, Prudence Crandall, Saint Augustine of Hippo, Sarah Harris, Stefan Lanfer, Unitarians, UUA by Kitty Drexel. Bookmark the permalink.